It can be tough to cook on ekadasi days, and even harder to prepare desserts. 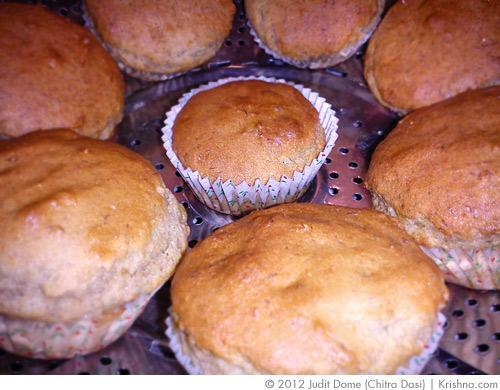 Cintia gives us a lot of options in her baking book, including this recipe that calls for powdered milk and potato flour instead of grain-based ingredients. Even if it's not ekadasi, you might like to try this cake. It calls for mashed bananas and toasted coconut, and then whipped cream and fruit to decorate. Yum! I was recently spring cleaning in our office (well, autumn cleaning), and in a file in an unused cabinet I found a hand written, photocopied page with a recipe on it. I don't know how successful the recipe is, or even where it came from, but wanted to put it out here in case anyone can try it and tell us if it's any good. I'd also appreciate any suggestions for improvement from the bakers and cooks out there. 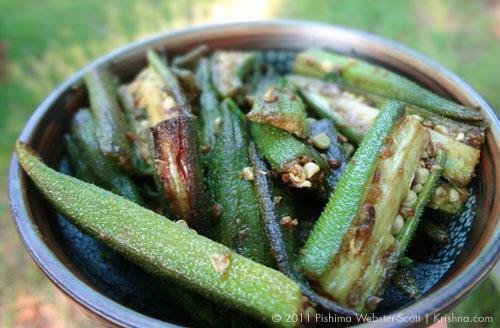 As a child okra (also known as lady’s finger or bhindi) was always a struggle for me to eat. I would force it down with a wrinkled nose, disliking every aspect of the experience. I have now come to the conclusion that it wasn’t so much the vegetable that I was so averse to, but the way in which it was prepared. If you are not careful with your okra, it can make any dish into a slimy, gluey creation. Of course if that is what you are going for, and I have to believe that some people are going for that, then right on. Known as "lady fingers" in India, okra is widely used in Creole cooking and is a popular soul food in America. If you can't find okra in supermarkets, look for it at Asian grocers. Choose pods that are small, firm, tender, and bright green. The trick for cooking okra is to fry it until it looses that 'slimy' texture that turns so many people against any dish with okra in it. 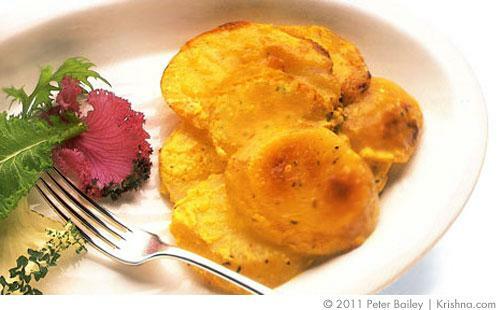 In this dish, slices of potato are folded with herbs, butter, and sour cream and baked to a golden brown. It is irresistibly rich and delicious, yet effortless to prepare. 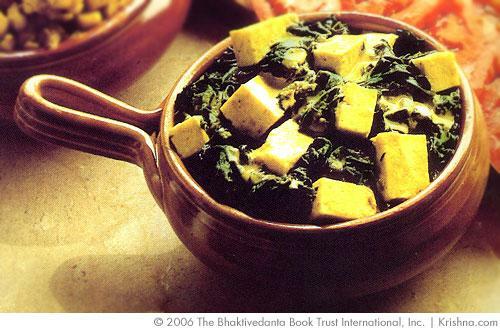 There are many variations on this recipe, and this one was taken from Kurma's "Great Vegetarian Dishes". It is a rich dish and is usually best served with some simpler side dishes like salad or vegetable stir fry. Winter is a great time to cook a big pot of soup for dinner (and if you are lucky lunch the next day). As a child, I was not the biggest fan of soup. But this particular soup, when my mom made it, was always yummmmm. All kids love this soup and Surya eats it up every time I make it. A visiting one-and-a-bit-year-old ate two and a half bowls today! I got the recipe from Mata and tweaked it a bit to pass on. 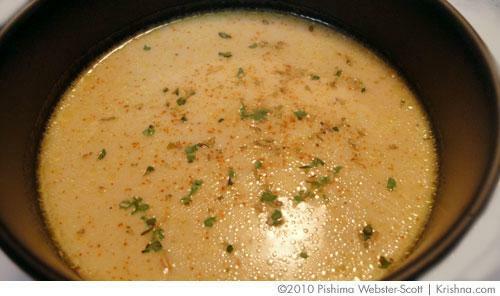 This potato soup is really easy to make, and filling too. Tapioca flour is used in this recipe to make the bread, and is combined with cheese, butter and milk to make a cheesy, delicious and chewy bread-like substance. Tapioca flour is available in health food stores, some Latin stores, and in Asian supermarkets. Going to an Asian supermarket will save you a lot of money over a health food store, but be sure to look specifically for tapioca starch. 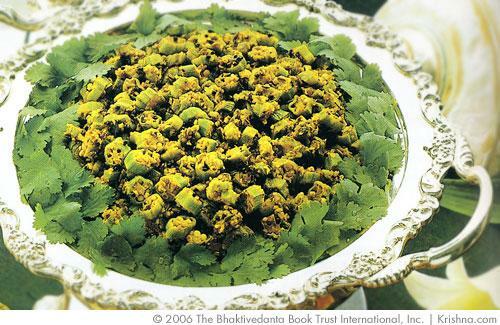 Carrot halava is a popular dessert dish served at ISKCON temples around the world on ekadasi days. Some people love it, and some are not fond of it at all. 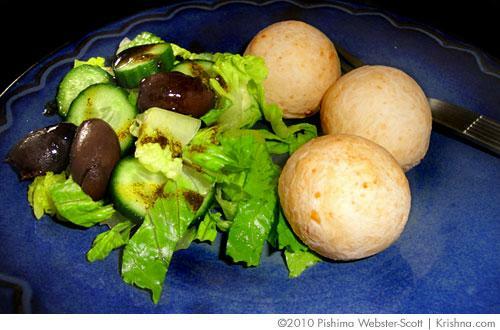 Try it out and see if you like this unusual variation on a favorite dish. It's not your average halava, which is made mostly of farina, but it is a traditional Punjabi style called 'gaajar ka halava'. This particular recipe might be from Kurma, or possibly Yamuna Devi (we would like to know), but there are many variations. 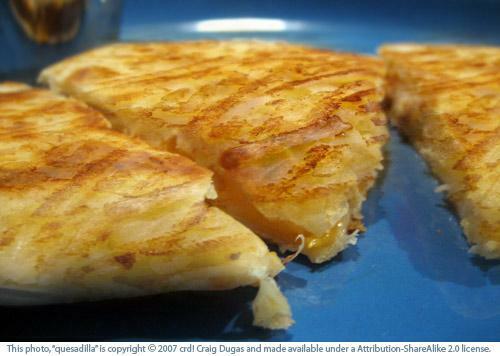 The great thing about quesadillas is their versatility. Any veggies or cheeses can be used. Feel free to play around with them; the combinations are endless.